Weed control is an increasing priority for many crop farmers today, especially with rising concerns about herbicide resistance in fields around North America. Just as high of a priority for many farmers is soil health. To that end, cover crops are joining no-till systems as an increasingly common way to sustain soil health without sacrificing crop productivity. The two have one major thing in common: neither works without a sprayer. The Chesapeake Bay region, an area not known for bumper crops but with high sensitivity to water quality and awareness of environmental issues, may seem a strange setting for Trey Hill. He’s a farmer who likens his operation more to a large, progressive Midwest row crop farm than smaller neighboring operations in the area. But, it’s where Hill calls home, operating a farm that’s been in his family for over a century. Harborview Farms started out near Rock Hall, Maryland, in the early 20th century, and by the time Trey’s father Herman Hill, Jr. brought his son into the operation in the 1980s, soil- and water-saving practices were moving up the farm’s priority list. Today, two of those practices are no-till and cover crops, and a foundational element to making them both work is Hill’s sprayer. Trey Hill approaches those practices through the lens of productivity, typically employing what many in agriculture would consider modern, conventional crop inputs, including full-rate chemical applications and genetically modified seed to maximize crop yield. Balancing those inputs with production systems like cover crops and no-till, he’s able to maximize output while being attentive to the long-term needs of his environment. In other words, two things historically considered mutually exclusive converge on Harborview Farms. Why go to the trouble to integrate environmentally sound production practices onto a farm whose goal is to maximize crop yield? The answer is simple: Hill sees direct impacts of a changing climate on his farm, and he wants to ensure Harborview Farms remains productive well into the future. While the right practices add up to production systems that wind up profitable for the farmer in the long run, the right combinations of technology and attentiveness to soil health and structure are helping Hill do more than make ends meet. For Hill, it’s not just about clean water. When he transitioned to no-till and cover crops, he kept a close eye on maintaining long-term productivity and farm revenue. Over time, these types of practices have made his soils more malleable in the face of widening weather extremes and capable of supporting bumper crops year-in and year-out. No-till helps create a more balanced environment for soils. When covered by crop residue year-round, soils in no-till systems don’t undergo typical wide swings in temperature common in conventional tillage systems. That residue helps the soils retain moisture better in arid areas and reduces erosion from both water and wind. The result is a more mellow seedbed with better-balanced organic matter. But in the absence of tillage, no-till farmers also rely on chemicals to provide pre-emergence and knockdown control of weeds that otherwise would be managed by tillage. Precision is important when controlling weeds in a no-till system, making it difficult to rely on commercial applications since hitting a specific targeted time window in of the utmost importance. While they add to the benefits of no-till, cover crops also create new demand for chemical applications. They have grown in popularity among farmers in recent years for some of the same reasons as no-till’s earlier surge in popularity: cover crops help preserve soil structure and health by preventing erosion and providing additional sources of soil nutrients. Often integrated into no-till production systems, cover crops take time to establish, but once a complementary mix has reached maturity, it can offset supplemental fertilizer and some herbicide needs if managed correctly. And, that management often includes using a sprayer to terminate the cover crop either immediately before or after planting a row crop. In addition to overall improved soil health and soil organic matter, benefits include increased row crop yield potential, grazing opportunities and reduced tillage costs. Since integrating cover crops into his crop rotation in recent years, Hill has begun “planting green,” a technique that involves terminating his cover crop by spraying after he’s planted his row crops in the spring, yet another process whose success depends greatly on having a precise, effective sprayer. By spraying after he’s sown his cash crop, he’s able to maximize the soil health benefits of the fall-planted crops that complement his corn and soybeans for reasons similar to the soil health benefits of no-till systems. The ability to better regulate soil temperature variation is just one of the benefits that make cover crops an ideal fit in many no-till systems in which cover crop residue can augment existing benefits of decreased tillage. “Residue mats minimize rainfall erosion, help maintain a constant soil temperature and decrease weed emergence,” Bergtold said. After planting, Hill applies a full rate of herbicide to terminate the cover crop that usually comprises cereal rye, barley or wheat along with a clover, rapeseed and radish mix. Once the corn crop is planted, the cover crop is terminated within five to 10 days. Why wait until after corn planting to terminate the cover crop? Hill said in addition to helping moderate soil moisture as well as temperatures, his specific cover crop mix has natural herbicide properties that complement the full rates of atrazine or other small-seeded broadleaf herbicides he applies after planting. Just like with chemical applications targeting specific weed pressures during the growing season, timing is hugely important when knocking down weeds when terminating cover crops after planting. Determining what will work best is a field-by-field decision process, Hill said. Just like with no-till systems, ownership of a sprayer is an important part of making a cover crop system work in many instances given the importance of timing the termination of the crop, especially when planting green. “Personal ownership of a sprayer is convenient due to the required timeliness of this type of operation,” Bergtold said. The combination of a wider spring planting window for corn and soybeans and natural season-long herbicide properties make cover crops a financially viable system for Hill’s operation, and he said he’s likely to continue working toward perfecting it to ensure his soils see continued benefits that will appear through continued strong crop yields and consistent soil organic matter and nutrients. He sees his sprayer as a critical component of managing his cover crops, and that will continue especially given the new components and features he expects in coming years. “I’d like to get pulsating nozzles to help better deal with dicamba. Those higher-tech nozzles will really come into play with that product,” Hill said. 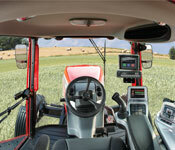 See some of the other technologies Hill has employed on his farm. If you’re interested in learning more about terminating cover crops with herbicide applications, start here. If you’re ready to get started but need to determine which sprayer is right for you, start here. Equipment Technologies was in many ways a startup when Jeff Goodman started with the company in January 1999. In the 20 years since, Goodman has been a big part of evolving the company’s production and manufacturing systems, as well as capabilities to meet growing demand for self-propelled sprayers. Though those early days trial by fire, he’s helped guide production, purchasing and manage the manufacturing process that today yields some of the most efficient, productive sprayers on the land. Today, Goodman is Director of Materials, managing the entire supply chain for Equipment Technologies. A big part of ETs success through the years has been its ability to outsource instead of building everything in house. For the outsource model to work, suppliers must understand their role in the product and the importance of delivering a reliable part, at a fair price on time, every time. Pulling this all together is no small feat and Goodman is quick to point out that it takes a great team for it to all work in harmony. Goodman approaches his work with both a passion to serve his customers and a hard-nosed drive to be productive, both traits he sees in many of his colleagues responsible for manufacturing Apache Sprayers. He knows that ultimately, one day he’ll pass off the reins of manufacturing and purchasing to another team member but is confident the company will continue to evolve to effectively meet customers’ changing needs well into the future. Though he still has some time before he reaches that point, Goodman said he hasn’t really thought much about retirement. But, he says he’ll know when he’s ready. Read more about Equipment Technologies team members here. If you’ve purchased, operated or worked on an Apache Sprayer in the last 20 years, there’s a good chance you’ve inspected some of Carl McFarland’s work. McFarland began working on the assembly line at Equipment Technologies in 1999 when the company’s manufacturing facility was located near the airport in Indianapolis, Indiana. At first, he saw the job as a way to do what he loved — working in manufacturing and playing a role in providing machinery for hard-working farmers — but he soon saw it was about much more than just the work. It was, and remains 20 years later, all about the people. Helping the company in the early days took a lot of hard work, McFarland said, but it’s that work ethic — a common thread among Equipment Technologies employees and leaders — that makes the company a unique place. McFarland is a man who values a hard day’s work, a job well done and contributing to a high-quality product that helps the customer do his or her job well. It’s reflected not just in the work he does every day — which over the years has covered the manufacturing and assembly of everything including sprayer frame rails, crossmembers, rear ends, fuel tanks, cabs and booms — but also how he wants to be remembered one day when he decides to retire. That day is not anywhere near, though, he says. “I hope when I retire that people remember me as a hard worker and someone really nice to work with because I truly love working here,” McFarland said. Ensuring your Apache Sprayer is thoroughly cleaned and free of any chemical residue is a major part of winterizing your machine. But, that’s just half of the equation when it comes to making sure your sprayer is ready for winter. Once all systems are free of chemical, it’s important to add antifreeze to prevent any damage ice can cause in tanks, hoses, nozzles and other components that can lead to headaches for the operator during the application season next year. The first step in this process is to gather the appropriate quantity of antifreeze in manageable containers. The average application system will require 30-40 gallons of antifreeze for the product tank, around 10-12 gallons for the rinse tank and 2-3 gallons for the eductor tank. The containers you’re using will dictate where you will add the antifreeze to the product tank system; if you’re using 1 or 5 gallon jugs, you’ll add the antifreeze to the top of the tank. For a bulk system, it will be added via an attachment to the valve on the side of the product tank. Even though they are all ultimately connected, each circuit – product, eductor and rinse tank – should be individually rinsed and filled with antifreeze when winterizing the machine. It’s important to watch closely to make sure you’re running enough antifreeze through each system to ensure cleanliness and winter preparedness, according to Apache Sprayers Senior Application Specialist John Casebolt. Casebolt recommended allowing at least two minutes of spray time for each boom section to enable enough antifreeze to move through and remove any water or chemical remaining in the tanks and booms. Each circuit includes different functions important to address in winterizing your sprayer. For example, the product circuit features an agitation function, and it’s important to engage it in flushing the system with antifreeze. The same is true with the machine’s Rotorflush circuit as well as the chemical eductor circuit. Each has unique components that are essential to address in making sure you’re adequately winterizing your Apache Sprayer. Once your sprayer is adequately cleaned and has the necessary antifreeze to prevent damage from freezing temperatures over the winter, it’s time to turn your attention to other components that can be damaged during the winter. Hear more from Casebolt on how to add antifreeze to preserve your application circuits here, or move on to our third winterization video for the final steps. Though the major components of a sprayer – product system, rinse loop, agitation and inductor loops – deserve much of the attention during the winterization process, it’s important not to neglect other parts and components that are important to the machine’s operation during the growing season. And, the right winterization now can prevent costly and time-consuming breakdowns and delays when it’s time to spray next year. Once you’ve winterized your sprayer’s application system, there are other components to attend to before you put the machine away for its winter nap. Any gauges and controllers should be part of the winterization process, said Apache Sprayers Senior Application Specialist John Casebolt. 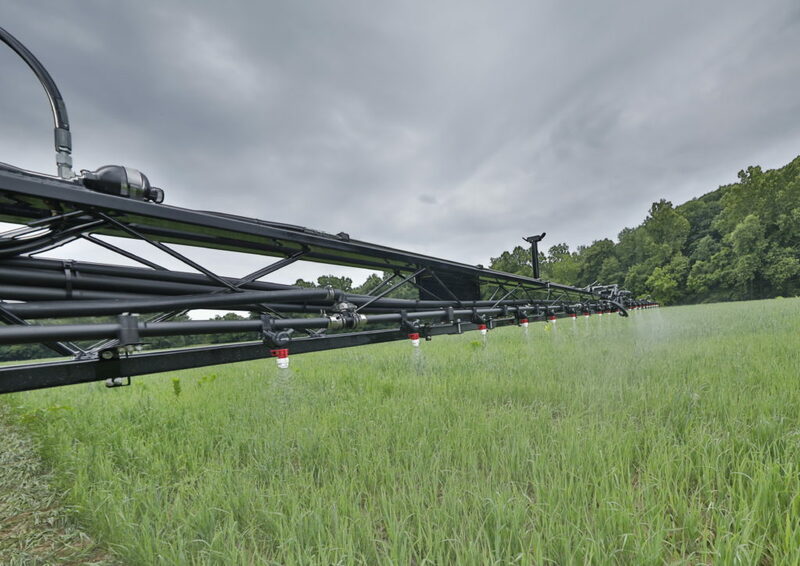 If your Apache Sprayer is equipped with pressure system gauges, it’s important to ensure both the boom pressure gauge and the agitation pressure gauge are first disconnected, then cleaned and prepared similar to the process for the product system. Look for the gauges on the right front corner of the Apache cab, and make sure the plumbing running to and from the gauges is properly rinsed, dried and winterized with antifreeze, according to Casebolt. In-cab electronic controllers should also be removed when winterizing your sprayer, especially if stored in a cold location. Current systems available in Apache Sprayers, like the Raven Viper® 4 product pump control or 600S GPS receiver, can withstand cold temperatures, but it’s best to store such electronic equipment in a warm, dry place, as temperature fluctuations can sometimes damage internal components. “Come spring time, we’ll plug it back in and the settings should be retained, and we should be ready to go,” Casebolt said. For more information on winterizing your Apache Sprayer, consult your owner’s manual or contact your local dealer. Your Apache Sprayer has worked hard during the growing season to perform a critical role. Now, it’s time to make sure it’s prepared for a winter nap, so when it’s time to spray next season, your machine is ready to go. Winterizing your sprayer is important to keep your sprayer functioning optimally in the long run. That process starts with ensuring your machine is clean, dry and free of any chemical that could become a harmful residual when it’s time to begin spraying again. A thorough clean-out helps prevent component damage from residual chemical and ensures you can spend your time in the field, not in the shop, when it’s more of the essence during the growing season. Casebolt recommended purging any remaining water and chemical from the systems by using an air compressor. Using an adapter to connect the air nozzle directly to the sprayer’s main intake, he said it’s easy to send air through the system at between 40 and 60 PSI, ensuring that ball valves are opened and closed to propel air through the system without building excessive pressure. If your sprayer is equipped with an automatic control system, like the Raven HawkeyeTM system available on Apache Sprayers, it’s important to switch the system to manual mode so you can open and close valves manually as you work through each component and boom section. Once you’ve completely purged the system of water and chemical, the next step in the process is adding antifreeze, which will keep lines and other components from freezing during the winter. 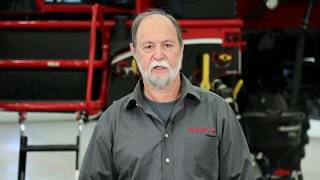 See more from Casebolt on how to properly rinse and dry out your sprayer’s application loops in the video below. 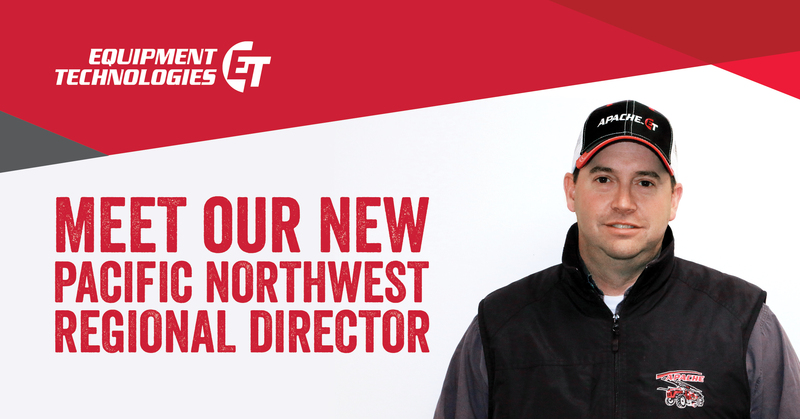 Cam Sweeney steps into his new role as regional director for Equipment Technologies in the Pacific Northwest with a definite opinion and strong understanding of the machines. And he’s looking forward to applying that passion and knowledge to his new role. “I sold Apache Sprayers for about seven years. It was my favorite product to sell,” said Sweeney, who joins the ET Sprayers team after working for the cooperative Morrow County Grain Growers in north-central Oregon. As Regional Director, he works with Apache Sprayer dealers in Oregon, Washington, Idaho, Montana, California, Utah and Nevada. For Sweeney, the Apache and Bruin Sprayers are a good fit for both him in his new role with the company as well as the farmers he services through the network of dealers for whom he provides sales and support resources in his seven-state territory. Apache and Bruin Sprayers appeal to his area’s farmers for reasons ranging from the machinery itself to the culture of the overall company, both at the corporate and dealer levels. The new Equipment Technology Regional Director who lives in Heppner, Oregon, said he’s looking forward to sharing the ET Sprayers story with more dealers and potential customers. He anticipates growth in the number of machines sold in his region as more producers learn about the simplicity, effectiveness and longevity of ET Sprayers. When he’s not working with Equipment Technologies, you can usually find Sweeney spending time with his 4- and 6-year-old sons, bow hunting or fishing for steelhead, bass or salmon in the Columbia River region. 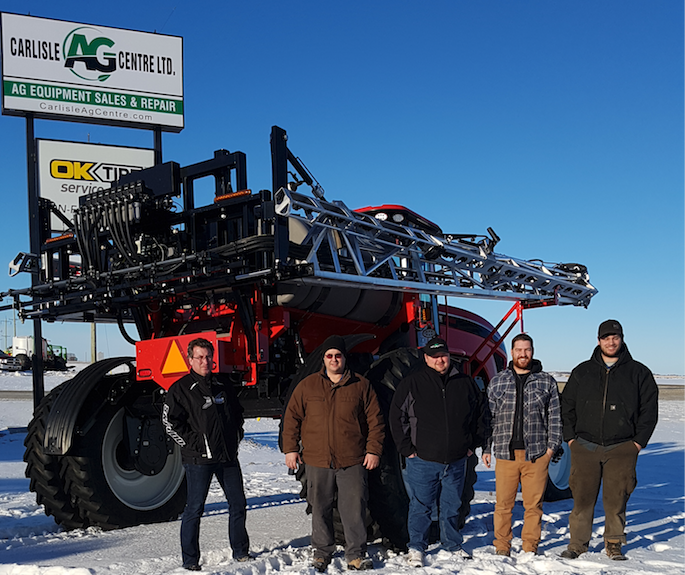 Darrel Carlisle provides equipment, inputs and services that his customers need, so when the opportunity arose to become an Apache Sprayers Dealer for Equipment Technologies, he knew it would be a good fit for his dealership in Southwest Manitoba. Carlisle started his fertilizer business in 2005, offering liquid starter and in-furrow fertilizer catering to the soil and crop fertility needs of the area’s primarily grain farms. Carlisle, a farmer himself, later added an OK Tire franchise at the same location and is looking to establish Apache Sprayers as a major line of equipment for farmers in the 80-mile radius his businesses serve. Part of what makes Apache Sprayers such a good fit in his area is their relatively simple and straightforward components that make maintenance more manageable. As digital technology has become more prevalent in farm machinery over the last decade, it’s made what’s historically been largely mechanical work more of an exercise in technology management. In some cases, that’s made it difficult for some maintenance technicians to continue to maintain high levels of service for farmers. 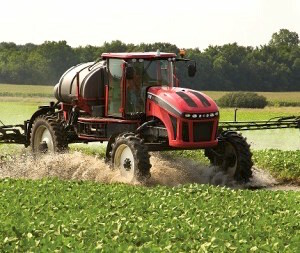 In the case of Apache Sprayers, Carlisle sees the right balance of conventional mechanics and technology to the ultimate benefit of his customers who operate the machines. “These machines aren’t completely full of electronics that make maintenance issues difficult to diagnose. They’re farmer-friendly to maintain. While the service techs can do as much today with a laptop as they could do previously with a wrench, these machines are easy to work on with features like mechanical drive,” Carlisle said. That evolution of farm equipment like sprayers, though posing a challenge, has created new service realities that enable dealers like Carlisle to better serve his customers. Even though it can sometimes require building trust in newer technology among some customers, Carlisle said new technology — especially functions like remote monitoring — can enable his service technicians to provide better service in many cases, fulfilling an important promise he makes to his customers. It’s that shared priority of efficiency — as well as a hands-on approach to working with sprayers — that Carlisle sees as a common bond he shares with Equipment Technologies and Apache Sprayers staff and leaders. Those are just a few of the reasons why he sees a bright future in connecting his customers with Apache Sprayers, both in the short and long terms. Both their shared philosophies as well as the enthusiasm to introduce Apache Sprayers to a new customer base in Southwest Manitoba are also shared between both Carlisle and the team at Equipment Technologies, and the new business relationship is likely to pay strong dividends, with farmer-customers being the ultimate benefactors, said Matt Hays, CEO of Equipment Technologies. Is a self-propelled sprayer on your farm’s machinery shopping list this year? If that’s the case, a combination of year-end pricing and tax incentives means there’s no better time to buy than right now. The Internal Revenue Service (IRS) is offering bonus depreciation for business-related expenses under Section 179 of the tax code. In the 11 years since its inception, Section 179 has helped businesses deduct the full purchase price of machinery, software and other business-related tools (up to a certain amount) from gross income. For farmers, it applies to common machinery and equipment they need for their operation, including self-propelled sprayers. This year, Section 179 bonus depreciation will allow business owners to deduct 100% of the financed purchase price of related expenses up to $1 million. Section 179 depreciation is based on adjusted gross income. On top of Section 179 bonus depreciation, Apache Sprayers is offering a $5,000 bonus on any new 2019 AS1040 or AS1240 sprayer financed by the end of 2018. Put together with the Apache Sprayers $5,000 bonus, it can net considerable savings in the first year of a financing program. Want to learn about all of the $5,000 cash-back offer details? Get started here.